A Richard and Judy Book Club pick and a Radio 2 Book Club Choice. 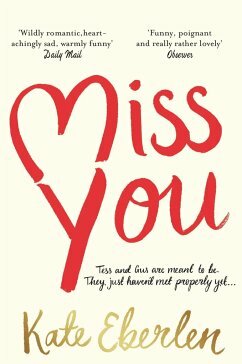 Get to know Tess and Gus in Kate Eberlen's first novel, Miss You, perfect for fans of David Nicholls and Jojo Moyes. Tess and Gus are meant to be. They just haven't met properly yet. And perhaps they never will . . . Today is the first day of the rest of your life is the motto on a plate in the kitchen at home, and Tess can't get it out of her head, even though she's in Florence for a final, idyllic holiday before university. Gus and his parents are also on holiday in Florence - and, for one day, the paths of these two eighteen-year-olds will criss-cross before they each return to England. Over the course of the next sixteen years, life and love will offer them very different challenges. Separated by distance and chance, there's no way the two of them are ever going to meet each other properly . . . or is there?